After faking a suicide attempt to garner sympathy, Sue is encouraged by Emma to hang around with New Directions. She does so, much to everyone's chagrin... only to eventually start enjoying herself. Especially after pitting Rachel against Mercedes and watching the girls get along by the end; and also be taken to the cancer ward of a hospital and singing to patients with Will. Both of these events helped Sue realize the power of music. She even joined the group for a performance. But this is Sue Sylvester. She had a new way to bring down the group for regionals: become coach of Aural Intensity. 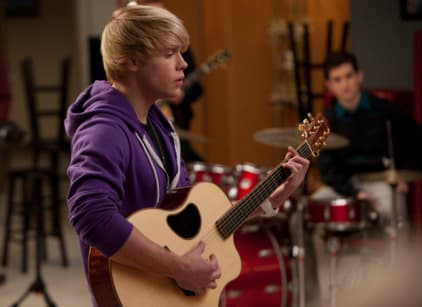 - Sam tried to impress Quinn by starting The Justin Bieber Experience, and the group totally won her over. But Santana then played mind game on Sam by just forcing him to open his eyes and realize that Quinn and Finn did kiss, no matter what story they were telling. He ended up dumping Quinn and getting with Santana. - Puck helped Lauren overcome her fear of singing. As a result, he didn't get to touch her knockers. But he's getting closer, she said. - Rachel had an idea for the group to sing an original song at regionals. Finn liked it, and told her as much. The installment concluded with a tease that there's hope for these two yet.